This OM3 Duplex Multimode Fiber Optic Cable is ideal for connecting 10GBase-SR, 10GBase-LRM, SFP+ and QSFP+ transceivers for 10 gigabit network connections. The uniboot connector allows two fibers to be carried through a single jacket. This reduces the surface area of the cable when compared to standard duplex cables, allowing this cable to facilitate improved airflow within a data center. 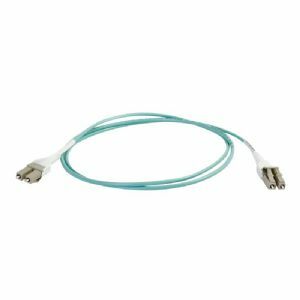 This cable provides backward compatibility with existing 50/125 equipment and the performance headroom required to support LED and VCSEL laser light sources, and 10 gigabit Ethernet applications in a datacenter or wiring closet.